Vic Firth Snare Drum Method Book 2 Intermediate PDF download. Book 2 is a continuation of the Elementary Snare Drum Method, Book 1. This book continues with 6/8, 2/4, 4/4, and 3/4 meter as well as introducing C, 2/2, 3/8, 9/8, 12/8, and 3/2 meter. It deals extensively with grace notes, known in percussion language as fams, drags, and ruffs. Book 2 develops the open roll, triplets, and syncopation. Also included are The 26 Rudiments of Drumming plus a section on bass drum and cymbal playing. There are two duets in the book to be played by the instructor and student together. These duets offer the student the opportunity to concentrate and apply his techniques while performing with his teacher who is playing an entirely different part. This helps establish both musicality and musical independence. In this book we are trying to develop a musical snare drummer: one who has control and fast articulate hands as well as a sense of rhythmic phrasing, interpretation, and concept of sound. He must treat the instrument as a rhythmic potential capable of countless musical subtleties. The book is presented as the second step toward the development of this objective. 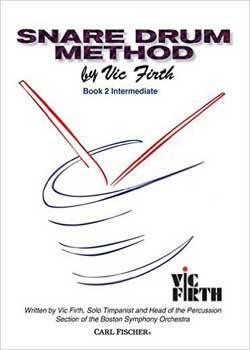 Download Vic Firth – Snare Drum Method Book 2 PDF free and other books from our site. Only high quality PDF scans. Please write a review, it's important for our community.